One trait of imperial decadence is untrammeled hubris. Given the increasingly arrant arrogance on display by United States’ officials, public figures and news media we can safely conclude that this empire is accelerating into decadence. A recent spectacular example comes with separate visits to Europe by US defense secretary James Mattis and Steve Bannon, the former aide to President Trump. Bannon was addressing a rightwing forum in Italy at the weekend in which he declared that he would be devoting “80 per cent” of his time to help anti-European Union parties win seats in the next European parliamentary elections due in May 2019. 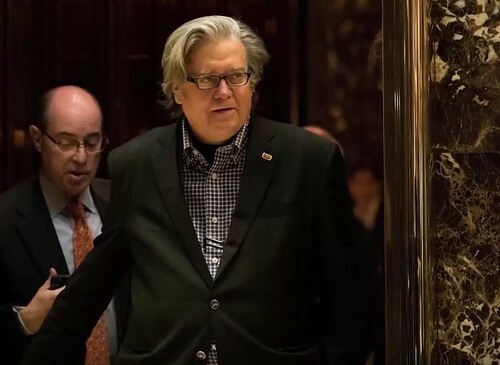 Bannon said he was setting up a coordinating committee, called “The Movement”, in Brussels, from where his political project would direct “war rooms” across Europe to ensure that anti-EU and anti-immigrant parties would succeed in gaining up to a third of the total seats in the 27-nation member bloc’s parliamentary elections. In short, a declaration of political warfare. Unapologetic. Brazen. Arrogant. The American ideologue and former Goldman Sachs banker, who is accused of inciting racism and neofascism in the US, has openly backed nationalist politicians in Europe, from the UK’s Nigel Farage to France’s Marine Le Pen, Hungary’s Victor Orban and Italy’s Matteo Salvini. Bannon is threatening to explicitly unravel the European Union which he views with contempt for what he calls is its “cultural Marxism”. Meanwhile, earlier last week, Pentagon chief James Mattis was in Macedonia where he gave his full-throated support for a Yes vote in the country’s referendum. The plebiscite to take place this weekend will decide if the small Balkan country can become a member of the NATO military alliance and the European Union. It is a crucial vote for the country. The irony of this combined American hypocrisy is truly astounding. For the past two years, US politicians and news media have non-stop accused Russia of “interfering” in their country’s democracy. First, in the 2016 presidential election, and now in the run-up to the mid-term congressional polls in November. No credible evidence is ever presented to substantiate these sensational American accusations against Russia, which some hawkish hot-heads like the late Senator John McCain have even gone as far as denouncing for committing “an act of war”. The same allegations based on “highly likely” innuendo have been trotted out against Russia for “meddling” in European polls, such as the Brexit referendum in June 2016, the French presidential election in May 2017, and now the referendum in Macedonia. While in the capital Skopje last week telling Macedonians to vote for joining NATO, Mattis had the brass neck to accuse Russia of interfering in the referendum. Typically, Mattis did not provide any evidence. He even admitted he didn’t know how effective alleged Russian influence has been in swaying voting intentions – meaning the US has no idea if Russia is really trying to meddle or not. But what we do know, as reported by US media, is that Washington has vociferously called for a Yes vote in the Macedonian referendum, including a personal call from President Donald Trump. Moreover, as US media also report, Washington has poured million of dollars into the Balkan country to “counter social media campaigns” calling for a No vote. The US says the flood of money is to counter alleged “Russian influence”, but a more straightforward explanation is Washington is actually the foreign power doing the influencing by railroading the Yes vote. Moscow has vehemently denied any interference in the Macedonian vote, as well as all the other so-called influence campaigns, from the US to Brexit, among others. Macedonia’s referendum is a tightly contested issue among its 2.1 million population. A US-run poll found in July that the Yes vote was backed by only 57 per cent of the electorate. Many Macedonians are opposed to the referendum’s proposal to change the name of the country to the Republic of North Macedonia, which would then pave the way to join NATO and the EU. There is reportedly an ardent No vote campaign, with social media platforms being used to argue the case against the new name being adopted, and, secondly, of joining the US-led NATO alliance. For many citizens, the historic name “Macedonia” should stand alone, and not be amended with the qualifier “North”. They say such a move is an unacceptable deference to Greece, which also has a province bearing the same name. In any case, it is a wild leap to attribute the No campaign in Macedonia on Russian interference. The pro-NATO prime minister Zoran Zaev has repeatedly accused Russia of meddling in the referendum. Macedonia has expelled two Russian diplomats over “meddling” claims. The Greek government has also joined in the media allegations against Moscow. There is a vested interest in pushing this anti-Russia narrative. If the referendum goes to the Yes camp, then Athens wins out in the long-running name dispute over Macedonia. And the pro-NATO politicians in Skopje will have won their desired objective to ingratiate themselves with Washington. By talking up allegations of “Russian malign activities”, it is calculated that Macedonians may be prompted to vote Yes out of patriotic duty. Russia is of course opposed to Macedonia joining NATO, thereby becoming the alliance’s 30th member and signaling once again the relentless expansion of the multinational military force towards Russia’s Western borders. But to extrapolate from Moscow’s legitimate opposition to Macedonia joining NATO to claims of “interfering” in the referendum is unwarranted. There is no evidence, only the usual surfeit of innuendo and Russophobia. From Steve Bannon’s open declaration of “political warfare” against the European Union and James Mattis’ dictate to Macedonians to vote for NATO membership, the level of outright American meddling in Europe’s politics is off-the-scale when compared with anything that Russia is accused of, even if the latter had some basis, which is doesn’t. For American interference in other democracies, there is nothing new either. Recall how one of the American CIA’s first foreign projects was to buy the elections in postwar Italy to defeat the emerging Communists. Fast forward to how Washington actually reveled in its interference in Russia’s 1996 election for Boris Yeltsin. America has relentlessly meddled in scores of countries to determine election outcomes. Bannon and Mattis are but the latest brazen expression of US malign activity. Against the backdrop of baseless allegations against Russia, this in-your-face American hypocrisy and hubris is something to behold. This entry was posted in Elections, Europe, Fascism, Imperialism, NATO, Politics, Russia and tagged European Union, Finian Cunningham, James Mattis, Macedonia, Neo-Fascism, Rightwing, Russiagate and/or Russophobia, Steve Bannon. Bookmark the permalink. Interesting that breaking up the EU is a goal of American banksters. Almost as if the US FRB and the EU ECB are now in direct competion for resources. “And, you know, f—k the EU.” – Victoria Nuland, US Dept of State Regime Changes. That made me laugh, Helen. Thanks for commenting.